DeStefano’s first series, The Chemical Garden, was a meh series for me. It just didn’t have the impact and wow factor I thought it would. I did like DeStefano’s writing style, though, which is why I gave Perfect Ruin a chance. It was worth it. 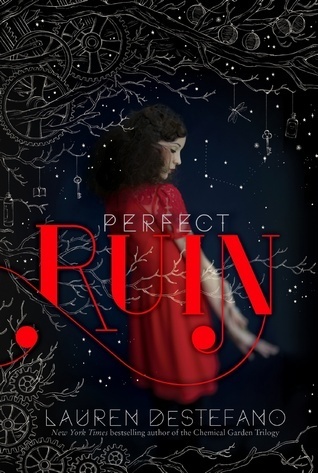 Perfect Ruin pulled me right in and I had a hard time putting it down. Morgan lives on Internment, the floating city in the sky. Everyone there is told to stay away from the edge and to be the best citizens they can be. It’s not enough for Morgan though. She wonders what the ground is like and what else there is to the world. She’s not content with what she’s told; she wants to know more. Her family has a black cloud hanging over their heads because Morgan’s brother Lex is what’s called a jumper. He tried to go off the edge. When he failed, he not only changed his life, but the lives of his entire family. I liked Morgan. She’s a very relatable girl, with thoughts and dreams that any teen would have. She has a betrothed, a best friend, and a family. She’s smart and pretty. She seems to have everything someone on Internment would want, but she knows there’s more to the world and she can’t help my daydream about it. She’s brave and levelheaded, wanting to do what’s best for the group, although she does have her moments when she doesn’t think things all the way through. I’m interested in seeing how DeStefano handles the romance side of things. I can see it going a couple ways and I know which one I would like to see. I’m going to place my trust in her, though, and hope she does what her characters need. I am loving Basil, though. He’s there for Morgan and believes in her when she stops believing in herself. He seems to truly care for her because he wants to, not because he was told to. It will be interesting to see where the story goes from here. This is a concept I haven’t read in quite this way before. Yes, the idea of an isolated society existing without contact from the outside world is an idea that has been written before, but not in quite this way. The ending is a bit of a cliffhanger, but not so much of one that I wanted to throw my book against the wall. It leaves an amazing setup for the next novel. Perfect Ruin is a fantastic beginning to another DeStefano series. The world she has created is amazing and I’m already invested in what happens to her characters. I’m anxiously awaiting the release of Burning Kingdoms. This entry was posted in Dystopia or Post-Apocalyptic, Mystery, Thriller, and Suspence, Something a Little Different, Young (and New) Adult and tagged Dystopia/Post Apocalyptic, Fantasy, Lauren DeStefano, Mystery/Thriller, Young Adult.